DEAR JERRY: After reading your informative column about RCA Victor's introduction in 1949 of the 45 rpm single, I have just one unanswered question. What was their introductory retail price? DEAR LANCE: I probably should have included the MSRP in that piece. 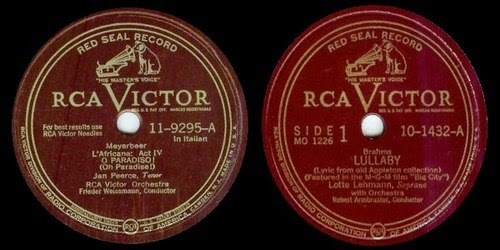 Unveiled in February 1949, RCA Victor's "little records [seven inch] with the big hole" had one of two possible suggested retail prices, exclusive of any sales taxes. RCA's Red Seal series, devoted to classical music, were 95 cents, but all other 45s were only 65 cents. Given that the cost of manufacturing a like number of classical singles should not be any different than an identical quantity of pop or country records, I tend to attribute the cost variance to the size of the print runs. Albums, not singles, have always been the format of choice for classical music lovers, and the same could also be said for jazz. Another factor would be the huge singles market for juke boxes, especially in the mid-20th century. Coin machine operators always wanted the current hits spinning at their locations, preferably tunes suitable for dancing. The 45 rpm was simply not made to showcase Beethoven's "Ninth Symphony in D Minor." As to the pricing discrepancy, some classical aficionados suspected that, since they usually had more disposable income, why not charge them a bit extra. Curious as to what those seemingly inexpensive prices are if allowing for 65 years of inflation? What 65 cents could buy in 1949 would now require approximately $6.75. And 95 cents equates to about $9.90. Coincidentally, the retail price range today for most new seven-inch singles is $6.00 to $9.00. Relative to the overall economy, the cost of vinyl music is actually unchanged since 1949. We are often asked to identify the world's first 45, but there is no singular answer to that. RCA simultaneously released a batch of 45s, including ones representing most of their primary musical styles. Making the event more colorful, singles in each of seven categories were produced using different vinyl colors. Those color/genre combinations were: cerise, (cherry red), for Blues & Rhythm; green for Country & Western; sky-blue for International (foreign); midnight blue for Popular Classics; red for Red Seal Classical; yellow for Children's Entertainment; and basic black for Popular. DEAR JERRY: I collect the music of the 1960s, and, since I file my singles by label, one thing has jumped out at me. In terms of sales, that decade seemed to be dominated by just a few companies. You'd expect Capitol (Beatles, etc.) and RCA Victor (Elvis) to be near the top of the heap, but what about Motown, and its offshoot, Tamla? For an independent outfit, they had sensational success. Which record companies had the most No.1 hits in the '60s? DEAR ALAN: Good question, especially since we have never researched the companies with the most chart-topping hits of the 1960s. So as not to miss anything noteworthy, I'll use both Billboard and Cash Box surveys. We will list the seven companies with 10 or more No. 1 hits in the '60s. Most are conglomerates with more than one label, but for this purpose we'll combine their totals. IZ ZAT SO? Because "The Motown Sound" became a term of endearment, many think that Motown came first, with sister label Tamla born later. Truth is that Tamla is the older sister. Tamla's first issue, Marv Johnson's "Come to Me" (Tamla 101) came out in January 1958. About nine months (a gestational coincidence), and eight more Tamla singles later, Motown's debut single, "Bad Girl" by the Miracles (Motown G-1), was released. Pre Beatles, Capitol had only one No. 1 hit in the '60s, Kyu Sakamoto's "Sukiyaki." Before that, their most recent one was the Kingston Trio's "Tom Dooley." Without the Beatles, Capitol, then with only eight other entries, would not even be on this list.